Manila, Philippines - ABS-CBN announced today, June 3, 2014 that the network has sustained ratings supremacy in May 2014 versus rival station GMA-7. ABS-CBN swept all the spots on the top 10 list and hit an average audience share of 44%, or 11 points higher than GMA’s 33%, based on Kantar Media. ABS-CBN maintained its winning streak on primetime (6PM-12MN), enjoying a three-point increase from the average audience share of 48% in April to 51% in May, a whopping 21-point lead over GMA’s 30%. The Twitter-trending singing-reality show “The Voice Kids” topped the list of the top ten most watched programs in May and hit an average national TV rating of 34.1%. Its pilot episode on May 24 garnered a national TV rating of 33.3%, or almost thrice the 11.9% rating of GMA’s “Vampire Ang Daddy Ko” on the same day. The top 10 list includes “Dyesebel” (30.6%), “Ikaw Lamang” (30.5%), “Maalaala Mo Kaya” (28.6%), “Wansapanataym” (26.3%), “The Legal Wife” (26%), “TV Patrol” (25.6%), “Rated K” (22.3%), “Mirabella” (20%), and “Bet On Your Baby” (19.5%) and “Home Sweetie Home” (19.5%). The comeback of the phenomenal showbiz-oriented talk show “The Buzz” on May 18, dubbed as “The Buzz 15,” scored a national TV rating of 8.9% trumping “Startalk” with only 4.9%. The return of the Philippines’ King of Asianovelas Lee Min Ho via the afternoon Korean drama “The Heirs” was also warmly welcomed by Filipino viewers. It debuted on a high note last May 26, recording a national TV rating of 13%, outdoing “Jewel in the Palace” that rated only 7%. 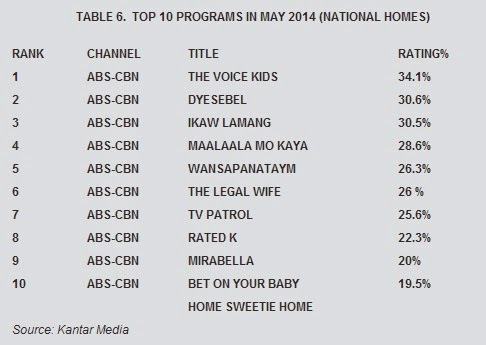 ABS-CBN also won in other key territories across the country. In Balance Luzon (all areas in Luzon outside Mega Manila), it earned an average audience share of 46% vs GMA’s 34%; 56% vs GMA’s 25% in the Visayas; and 55% vs GMA’s 27% in Mindanao.